Hot Chips ARM's employee number 16 has witnessed a steady stream of technological advances since he joined that chip-design company in 1991, but he now sees major turbulence on the horizon. 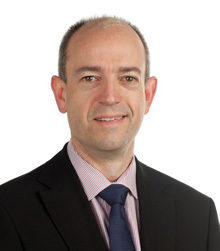 "I don't think the future is going to be quite like the past," Simon Segars, EVP and head of ARM's Physical IP Division, told his keynote audience on Thursday at the Hot Chips conference at Stanford University, just north of Silicon Valley. "There may be trouble ahead." The microprocessor industry has enjoyed an almost unbroken streak of improvements, Segars said, citing advances in silicon manufacturing techniques, power reduction, and gadget-size and gadget-cost shrinkage – he brought along a 1983, $3,995 Motorola DynaTAC as a prop. But the landscape is changing. The low-hanging fruit has been picked, and a new way of thinking will be needed to provide the world with the squillions of low-cost, low-power microprocessors that the increasingly mobile computing ecosystem requires – not to mention the everything-connected world described by the current buzz-phrase: "The internet of things". Harkening back to when he joined ARM, Segars said: "2G, back in the early 90s, was a hard problem. It was solved with a general-purpose processor, DSP, and a bit of control logic, but essentially it was a programmable thing. It was hard then – but by today's standards that was a complete walk in the park." He wasn't merely indulging in "Hey you kids, get off my lawn!" old-guy nostalgia. He had a point to make about increasing silicon complexity – and he had figures to back it up: "A 4G modem," he said, "which is going to deliver about 100X the bandwidth ... is going to be about 500 times more complex than a 2G solution." 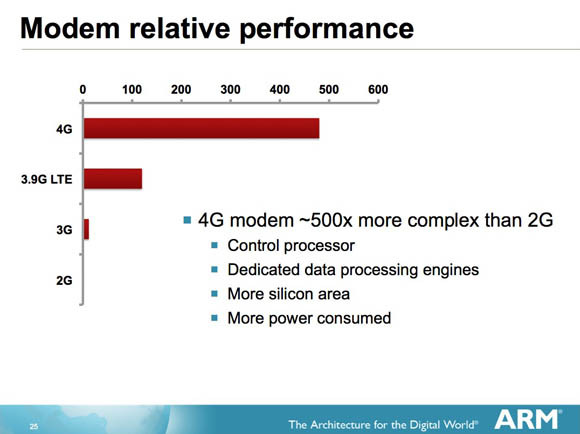 The way that the 4G-modem problem will be solved, Segars said, will be by throwing a ton of dedicated DSP processing engines at it – which will, of course, require a lot of silicon real estate. "But that's not so bad," he said, "because silicon's being scaled the whole time. But it's going to eat a lot of power, and power is the real problem." ARM is a mobile-processor company, and mobile processors run on batteries – and Segar said that the power required to juice increasingly complex silicon is a system-level challenge. "The reason for that," he said, "is because batteries are pretty rubbish, really." As silicon technologies have improved in comparative leaps and bounds, batteries haven't. "Historically," Segar said, "battery power has grown about 10 or 11 per cent per year, which unfortunately is not very well-matched with Moore's law."